For years, the federal government has adopted roadway guidelines that fall far short of what’s needed — and what’s possible — to protect cyclists and pedestrians. By “playing it safe” and sticking with old-school engineering, U.S. DOT allowed streets to be unsafe for these vulnerable road users. But that could be changing. The bike-friendliest transportation secretary the country has ever seen told state transportation officials yesterday at AASHTO’s annual Washington conference that U.S. DOT was getting into the business of issuing its own design standards, instead of simply accepting the AASHTO guidelines. LaHood told an audience of state transportation officials that the FHWA is getting into the roadway design business. Normally, the Federal Highway Administration points people to AASHTO’s Green Book, the organization’s design guide for highways and streets — and indeed, the agency is still directing people to the 2001 edition of the Green Book. Cycling advocates have long criticized the AASHTO guide, and the FHWA’s adherence to it, since even the most recent version doesn’t incorporate the latest thinking in bicycle and pedestrian safety treatments. FHWA will rely heavily on input from AASHTO but also signaled that it would work with others to incorporate the full spectrum of bike/ped design best practices. The National Association of City Transportation Officials publishes its own, much more cutting-edge, design guide for bicycle and pedestrian infrastructure. No one at U.S. DOT reached out to NACTO in advance of the AASHTO speech, but NACTO spokesperson Ron Thaniel said they have a “close working relationship with Secretary LaHood” and “look forward to working with him” on the new standards. Our job is never done. We can always do better, and that’s especially true when it comes to bicyclist and pedestrian safety. I’m going to meet with cyclists — their meeting is here in Washington next week, and we’re going to continue to work with the cycling community on promoting bicycle and pedestrian safety through public education, such as encouraging bike riders to wear a helmet, and through improved infrastructure in more livable communities that make biking and walking opportunities as safe as they possibly can be. We need your help in this. We know that people are cycling more and walking more and that pedestrian and cycling safety has to be a priority. We must ensure that our streets, bridges and highways are safe, whether we’re in a car or on a bike. So I’m asking them for their help but I’m asking you to be helpful also. I know that most of you want to build the 21st century infrastructure that your communities need to be competitive. The problem is we don’t have modern-day roadway standards to help us bring these ideas to life. Today, I’m proud to tell you that DOT is looking to create a standard guide for how we will build modern streets that work for everyone who depends on them. As we begin work on this, we’re going to look at the AASHTO bike guide — and other, similar types of assistance — to help us build streets, bridges and highways that keep all travelers as safe as possible. We’re going to build from your ideas in order to highlight bicycle and pedestrian safety as a priority. And we’re going to work with you as we create this critical safety resource. Businesses and travelers alike are looking to us to build modern infrastructure that not only meets their changing demands, but is safe as well. We must work together to meet the growing demand for bicycle and pedestrian infrastructure and to make these transportation options safe for more Americans. 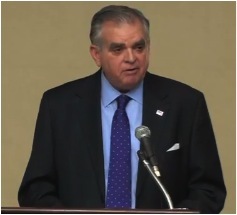 Thank you Ray Lahood!!! This is a game changer! The U.S. DOT should look at the highest bicycle infrastructure standards in the world for inspiration, the Dutch CROW manual. They can water it down from there by incorporating inferior design elements of Denmark, AASHTO and NACTO. Why copy the papers of the B, D and F students when you could use the A students papers. The Dutch have been refining their bicycle infrastructure designs for decades and their high modal share, and low injury and death rate for bicycling shows that it works. while the Green Book is still referenced, you need to mention that the latest AASHTO bike guide came out summer 2012. Pretty big omission for this article. good news tho! We need to get the bicycle riders off the sidewalks (unless they are walking their bikes). In Arlington I have barely avoided being hit and injured by silent fast moving bikes on the sidewalks on streets with bicycle lanes. We need a combination of simple regulations, incentives, and penalties to separate cyclists from pedestrians. This is a great step for safer roads everywhere. Thanks. If people are riding bicycles on a sidewalk on a street with a bike lane, clearly the bike lane does not provide the level of comfort and safety they need. Big thanks to Secretary LaHood and USDOT for committing to bring our bike infrastructure designs up to 21st century standards. My, what a lot of unfounded assumptions there are in that statement. I credit the U.S. DOT to date for wanting to keep decisions about street infrastructure founded on sound engineering study data rather than emotion about what “feels” safe to cyclists. NACTO is full of designs that look nice on paper, but have not been fully vetted in the American environment. It would be irresponsible of the U.S. DOT to just jump on the NACTO bandwagon without taking the time to fully study the new designs. To do otherwise would be to experiment with peoples’ lives, like those who have already been killed in supposedly “safe” bike lanes and bike boxes. “Playing it safe” is no vice when lives are at stake. The first rule should be the Hippocratic oath, “Do no harm”. @facebook-100000446587617:disqus Tell that to the thousands of pedestrians and bicyclists that are killed on US roads every year. Do no harm, indeed! Yes, including the families of the cyclists killed while operating as directed by a bike box or door zone bike lane. I’m not saying there’s not a problem, but that we need to be careful in our assumptions about what hardware will solve it, or indeed that hardware can solve it. I see AASHTO and FHWA being much more careful about vetting the true safety of paint and hardware applications than NACTO is. I should state that I’m only talking about bicycle facilities here. I am not knowledgeable of pedestrian facilities and do not presume to speak about them. @facebook-100000446587617:disqus Well then I’m not sure what your point is. I think there’s broad agreement that the US approach to bike safety (paint on the roads) is decades behind that of other, much safer nations. Given the relative danger of of traveling on US roads in general (whether by car, bike, or foot) compared to international peers, I don’t see how a “cautious” approach to reconsidering how US streets are administered and designed is anything but irresponsible. There’s a treasure trove of best practices developed in other nations, very few of which have been implemented here, and only sparsely at that. I think that’s what the original quote regarding “old-school” engineering is pointing out. Guest, my point is just because many of the NACTO designs have been “proven” to work elsewhere does not mean they will work well in our North American traffic system, which is different not only in its physical configurations, but also in our legal and educational framework, and cultural attitudes towards bicyclists. I am not against bicycle infrastructure per se, but I believe the best bicycle infrastructure is that which reinforces safe movement of all vehicles on the road, and some “cutting edge” infrastructure does not do this. I’m thinking of bike boxes in particular, but the general criticism probably applies to other NACTO facilities as well. I’m saying I support a more careful and SCIENTIFIC review of new facilities by traffic engineers who understand the rules of movement and their effect on safety, not the uncritical promotion of new facilities simply because they paint a highly visible place for bicyclists on the road and are thus seen as encouragement. That’s a marketing justification, not an engineering one. Safety comes from behavior, not paint, and facilities need to encourage safe movement by bicyclists, not confound the existing rules of movement. Maybe the speed at which FWHA and AASHTO study and approve new designs could be improved upon, but I think even the current slow speed is better than experimenting with a new design which could endanger cyclists by confusing the rules of movement and lead to deaths. Of course I hate cyclist fatalities, and I agree that they happen with and without bicycle infrastructure. But it’s even more galling when the public perception is the cyclist “was doing everything right” by following what the facility directed them to do, when in fact the facility ITSELF was directing them to engage in risky behavior, such as riding in the door zone and passing stopped traffic on the right at a signalized intersection. I know this is the minority view, but I do NOT think such facilities are “better than nothing”. They are worse than nothing because they reinforce risky cyclist behavior and reinforce the public’s expectation of it as the norm. @facebook-100000446587617:disqus I guess we have a different idea of what the core problem is. I see the legal, educational, and cultural issues as directly related to the history of physical configurations. In other words, a century of engineering “wisdom” has helped to foster our current culture. We weren’t always enamored with high-speed thoroughfares. I agree that we won’t reverse course simply through roadway design, but we seem to be in a chicken-and-egg situation: should our roadway designs wait until our culture sees the light? Or will culture respond to the introduction of best practices from elsewhere? A: it takes a decade or more to “assess” whether improvements like cycle tracks are safer than bike lanes. B: What has been proven to work elsewhere might not work here and therefore warrants a high degree of “study”. Virtually every other developed nation has improved their road safety relative to ours. This includes old Europe, but also nations whose circumstances are probably more similar to ours (Canada, Australia). Clearly, we’re doing something wrong. We can agree to disagree about some things, and I don’t want to repeat myself or get into detailed analysis of this or that study, which never proves anything in online discussion. I do agree that there are other things we can do with our infrastructure to improve things, like not build so many high-speed thoroughfares. And I’m certainly not saying I completely trust traffic engineers, or that they aren’t partly responsible for our current situation. (Although I don’t want to blame them entirely, as they are mainly just responding to what the culture wants, now and historically.) I agree that we are doing something wrong, but the devil is in the details. Online discussion is not a good forum for detailed engineering and statistical discussion, so I’m just going to sign off. Thanks for keeping it civil. I just hope AASHTO finally explains to DoT, LaHood and the folks at the National Bike Summit that the new bike facility designs go against good transportation design principles and are therefore unsafe. AASHTO publications have clearly pointed out the flaws and suggested solutions, but no one in cycling advocacy seems to take a bit of notice. At least someone else sees this and has the fortitude to say something! Look! There are lots of good things in the NACTO guide but a few things give me the heebee geebees and much of the citations justifying these “innovations” are circular (referencing other NACTO city documents and NOT independent analysis). While there is little really innovative treatments in the AASHTO guide which is somewhat disappointing, at least EVERYTHING in that guide has been peer reviewed and vetted. another power grab by those who have no money in the pot. With this federal change, Its time for the feds to tax the bicyclist to pay for the cost of the improvements. Why should bicyclists have to directly pay for the costs of infrastructure when every other single form of transportation gets a subsidy? Well said. What would this mean though for bike retail shops like Saturday Cycles? That is a crazy, crazy position. Should pedestrians have to pay to walk too? We are all pedestrians and we are all potentially people who ride bicycles. Speaking as a driver, I want bike infrastucture built with the same money that builds sidewalks and roads!